Health and Life insurance agencies including everything from one and two-person agencies to MGAs and IMO/FMOs. AgencyBloc, The #1 Agency Recommended Management System, helps life and health insurance agencies grow their business by organizing and automating their operations using a combination of an industry-specific CRM, commissions processing, and integrated marketing automation. AgencyBloc for Health & Life Insurance Reviews Recently Reviewed! All In One Insurance Solution for Brokers! Pros: Biggest pros are the ease of customization and searchability, and the simplicity of use on any device. The entire CRM is mobile friendly, so even on the go, the whole system is at your fingertips. Cons: The only real con other than a relatively hefty learning curve (which is expected with this many features) is the lack of a built in rate engine - obviously not a huge deal with so many out there, and if nothing else, it's likely something planned in the future. Regardless, it's easy enough to write a cross-post into a quoting engine AND AgencyBloc without disrupting either one. Overall: AgencyBloc is the single best all-in-one insurance platform out there - and I've used just about all of them as the IT Director for Custom Health Plans. Absolutely any part of the system can be found from a top level search, and the lead system especially has unparalleled versatility for customization. It's even possible to post directly into the CRM, and combined with the autoresponder capability, you can have an instant-deploy message go out the moment a lead comes in. It also has a very Google Calendar-esque notification function built in, so you'll never miss a lead having a birthday or with a policy running out. Last but not least, the staff are super responsive, and listen to agents' requests for new features or tweaks to existing ones. Gary Marr especially on their technical team has been a non-stop asset to our overall online endeavors, and is a true gem within AgencyBloc - having an awesome system is great, but having an awesome system with technicians who care is absolutely stellar. Recommendations to other buyers: Just make sure you've got time to really dig in and learn the back end dashboard - it can be a little overwhelming at first, but the staff is super at ensuring you understand the tools they provide, and there are VERY extensive tutorials in their knowledge base. Extremely User Friendly & A MAJOR Time Saver! Pros: Before we purchased the Agency Bloc software, I was spending a good majority of my time simply inputting commissions. This was all done by one person (me! ), and I was simply not able to keep up with this exhaustive process, and take care of our customers and their respective issues to boot. Since utilizing the commission feature on Agency Bloc, I now have the necessary time to help our customers and spend the time with each and every one of them. No more working nights and/or weekends just to keep my head above water. Also, the customer service that Agency Bloc extends is absolutely beyond compare. Our rep never fails to respond to our pleas for help (regardless of how trivial), and gets back to us the same day, and usually within the hour even. THANK YOU so much! I would highly recommend Agency Bloc to any insurance agency that is looking to streamline and organize their customer base. With AB, you can be as detail oriented as you like, and rest assured that they will be there to assist you 100%. Overall: There are too many to list. But, mainly, the fact that our customers are all in one easy spot, and since we have two office locations, all of us are able to access and utilize the program. I personally have saved many, many hours of my work week, as am now able to simply upload most of our commissions directly into Agency Bloc, and don't have to spend my valuable time simply inputting numbers into Excel. Pros: It's fairly strait-forward to use. The way everything is labeled, after a small amount of training we are able to keep multiple users consistent with data entry. This enables more accurate reporting, which in turn helps with other aspects of running our company such as marketing. Cons: Duplication of information - Policy detail and coverages share several of the same data points. I question a bit of the accuracy of reports. Recently I pulled up all active clients and updated missing information. Shortly after that a coworker was pulling up several accounts that had missing information. I have also had a couple of coworkers tell me some attached information had disappeared. This has not happened to me, so I have not been able to determine if it was operator error or the program. Overall: Being web based, it is easy for our company with several remote offices to all use the same data base. It also makes it easy to access information off site as our agents meet with people outside the office on occasion. Pros: Making the decision to change agency management software is extremely difficult but when you run into substantial limitations on functionality it is time to look at alternatives. 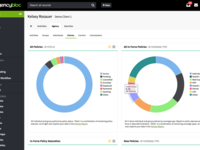 After switching to Agency Bloc I immediately found that I could generate reports in seconds that took me much longer to generate on my old system. I found the interface to be much more user friendly and service team was there to solve the few minor glitch moments that came up. Perhaps the most important "Pro" I have found is off site storage. We all know the importance of backing up data and we all think we have taken this important setp. I thought that as well, but my server crashed last week and some of that data that I thought was being backed up was not backed up. My existing agency management firm charged me for rebuilding a couple of files and it took some time to get it done. The information on Agency Bloc was unaffected because it was not stored on the server. This is a real plus. Cons: For some reason it seems that the people who design these agency systems get carried away with setting up functions that the average agency just does not use. In some cases the information that I would like to see on one centralized screen requires that you either change screens several times or set up a "custom" page where you can put the info you want to see in one place. I would like to see more "user defined" fields on the main screens but the ability to set up custome fields on some of the pages works with a little effort. Overall: If you are looking for a software system to run an agency that specializes in group life and health and related lines you should take a look at the Agency Bloc product. It is easy to use, fairly inexpensive, and does a great job generating reports and tracking clients. I am very happy I am making the switch. Pros: Is it is not only user friendly but adaptable to my needs. I can make changes in certain areas to custom what I am looking at. Cons: Of course I want to be able to customize it more in certain areas. Overall: I have been using this system since 2013 and will tell you there is no better on the market today. The customer service is second to no one. I call and they respond immediately to most of my issues. What really impresses me is what I jokingly call my Christmas list when i call in with a suggestion. You see if I feel like there is something missing that I would like to see implemented they carefully listen to me and ( not always ) but a lot of times have implemented the idea. We service approximately 45-50,000 employees and around 200 groups with this system. I believe ( and I have investigated ) that this is the best system in the market place that you can use to service your customers. I highly recommend them to everyone. Recommendations to other buyers: I would say just try it. Pros: Ease of use, does most everything we need it to. Allows my agents to access it from their tablets, phones and laptops while out in the field. Cons: There are a few functions that I wish AgencyBloc to do: Allow my agents to send out their own mass email campaigns. Wish it was more expensive to simply allow them to have access to their own commission payments. Wish they could also run their own reports, ie: missing commission reports. I feel to much is put on my simply because the agents don't have access to a lot of functions just simply because we don't pay a higher fee. Perfect Customer database software for the insurance agency. Pros: It is designed around what information I need to track for my customers so the reports are helpful. I am so glad I am not paying for more than I needed. I looked at Salesforce but it was too much for a small agency like mine. When my general agency recommended Agencybloc, it was perfect. Cons: The only feature I like least is the reporting. Takes a lot of time to figure out how to get the end result that we need for labels, forms, or other papers. We do not take the time to look at training or call, but I am sure if we did it would help. Great Database System, Improves Inter-departmental Communication. Comments: Our company started with a primarily paper based system and went to AgencyBloc specifically as a database to keep all of our client and clients employee information. We quickly realized that AgencyBloc was a powerful tool and saves us the time. We frequently need reports on our groups and employees to create quotes. The reports are easy to pull off of the Website and we rely heavily on them. The nice thing is they are always up to date and accurate which we didn't have with the excel documents we created without AgencyBloc. We used to have to input all of the information ourselves, now we just pull it from AB. It does mean that you have to be vigilant about making sure the information is current in AgencyBloc but once you get a system set up it is a huge time saver. Our customers are impressed with how fast we get information to them! The activity section has also proved to be really helpful. We are a small business and each of us work from home so communication within our company is vital. Activities allow us to document all of our interactions with clients and carriers, then each of us can view the activity for information. Therefore, we are never "in the dark" when communicating with customers or carriers...there are detailed notes that we can each refer to. The other thing I really appreciate about the system is that it has lots of features and you can choose which you are going to use and how. It is easy to customize to fit your specific needs. The AgencyBloc staff is always available to answer any questions we have and they are always willing to hear feedback. Some of the feedback we have given has actually resulted in changes, which means they listen! Overall, we have had a very positive experience with AgencyBloc and the staff that run it! 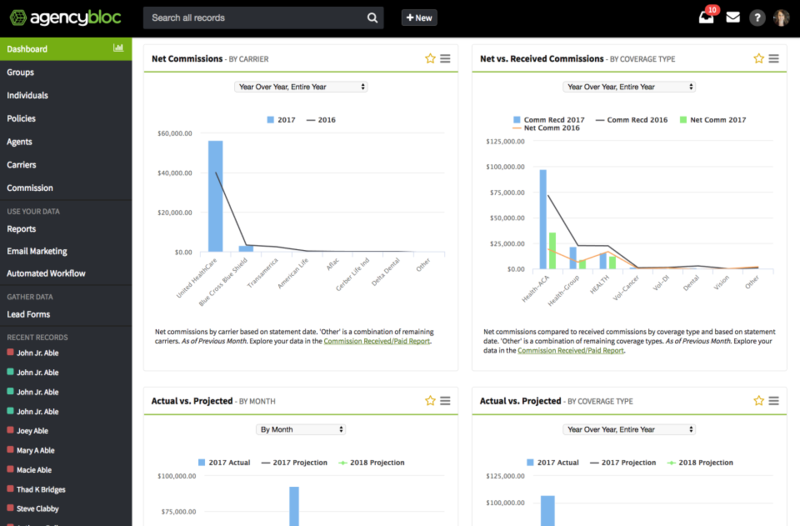 Pros: Easy to Use , Customizable, Lots of reporting Capability, follow up system using the dashboard is great. Also can use the system on your mobile device. Overall: We moved from GBS to AgencyBloc in 2016. The difference is night and day. All of our client information is available and easy to search and find. AgencyBloc did a mass transfer of information from GBS to AgencyBloc at the inception of their service. Although there were some updates that had to be done after the fact, the system is very user friendly and we did not lose any information. We like that we can set up scheduled phone calls to clients, and create follow up activities that show up in our dashboards. We also set up the birthday email function so our clients receive a birthday message from us. It has been well received. I feel that the system has much more potential that we have not yet tapped into yet with reporting. Looking forward to using the system to it's fullest potential. AgencyBloc is a Time Saver! Pros: You can set up automated emails to customers and forget about it. The system will automatically send out your welcome emails, birthday emails, holiday emails, etc. Then, you can check to see who opened the email, how many times they viewed it, and if they clicked on any links. This is a great way to find out how effective your emails are and if you should continue sending them. From my experience, whoever reads your emails the most, happens to be the customer who refers the most. Overall: AgencyBloc is a time saver especially when it comes to email campaigns. You can quickly sort out a list of customers to send specific emails to. Recommendations to other buyers: AgencyBloc is consistently coming up with new ways to improve. Great software with great support. Pros: I like the fact that it is a cloud based system with the ability to easily add custom fields. I also very much like the built in ability to do mass emails/email-drops as well as some built-in automatic workflow functions. Commission importing is also very easy and time saving. I like the continuous product improvements - most recently the addition of Outlook integration. We have also very much enjoyed the strong customer/product support from AgencyBloc. Cons: We had used a different software for more than a decade and I may be biased because of that. There is a feature, related to how AgencyBloc has products set up, that I am not keen on. However, it is not a major issue for our work and use of the system. Pros: This software is so easy to use and to learn whether you are familiar with using database software or not it is very intuitive. The customer support is excellent, including tutorials and live help. Also, love the agent tracking. It makes my contracting work so much easier. Cons: I cannot think of anything I really dislike. Overall: It has been great working with them and they keep improving the software's functionality. Pros: I love how this is setup specifically for Life and Health agents. There are so many customization that can be made, but it already is setup and can be used exactly how it is. There is an endless amount of customized reports that can be ran. This is setup so that if you are a single person or if you are an agency or even if you oversee multiple agencies this is built for it. It is affordable for a month for 1 person to use....Way cheaper than anything else i looked at. Cons: I use Facebook for marketing/lead generation. Agencybloc is not directly integrated with Facebook. I just currently emailed Agencybloc to get info on how to set this up. This is a well though out program and their custome service is excellent! Pros: Customer service. We appreciate that the updates are well tested and thought out before they are released. Cons: Some of basic reports could be more robust in terms of the ability to select any field in the database while choosing a report. Overall: A single location to store our cleint informations as well as commission data. In addition the ability to customize is excellent. Pros: Being able to connect a client with a spouse, a referral partner or a group account is critical for us. The software makes it easy to do all of these. Fabulous software, we are loving it and feeling so much more organized! Pros: Fabulous software, we are loving it and feeling so much more organized! Before this, we were using multiple documents on an intranet and this just pulled everything together for us. Super easy to use! Cons: The customization for fields is my favorite part, because even though the framework there is fabulous, every broker has different things that you need to track for clients. It's super quick to edit and organize. This is a must have product to manage large groups of clients. Pros: I love that I can customize the template for my clients needs. It is very user friendly when you need to add or subtract information. And works decently with other programs that are required at my office. Cons: I do not like how some of the search options function. Occasionally you can put in the correct client information and no file will pull up. The files there you just have to go to another piece of information, for example a telephone number instead of a last name. Overall: The benefits of using this product out weigh its downfalls in its ability to search for particular clients/files. Pros: This has made our tracking of clients and customer service so much better. And it is easy to train my staff and agents to use as well no matter their level of knowledge with previous CRMs. Cons: Sometimes the report tools are a bit restrictive, but they have improved greatly over the last couple of years. 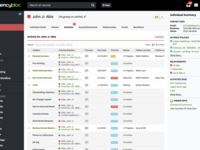 Overall: Better tracking, improved customer service ability and more efficient time management. Pros: This CRM can be customized to almost any business model. Dashboard gives a great overview of current view. Offers marketing tools and automated contact with clients. Easy to upload your database into this CRM. Customer service is great at helping through this process. 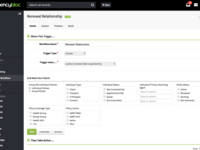 Offers commission reconciliation, lead management, automated workflow. Completely cloud based so it can be accessed from anywhere. Demo is available without having to purchase. Cons: Could use more customizing when it comes to health policies that are enrolled ON Exchange. Certain information that is needed to manage ON Exchange policies can not be linked. Otherwise a great platform. Super user Friendly! Great platform to keep business organized. 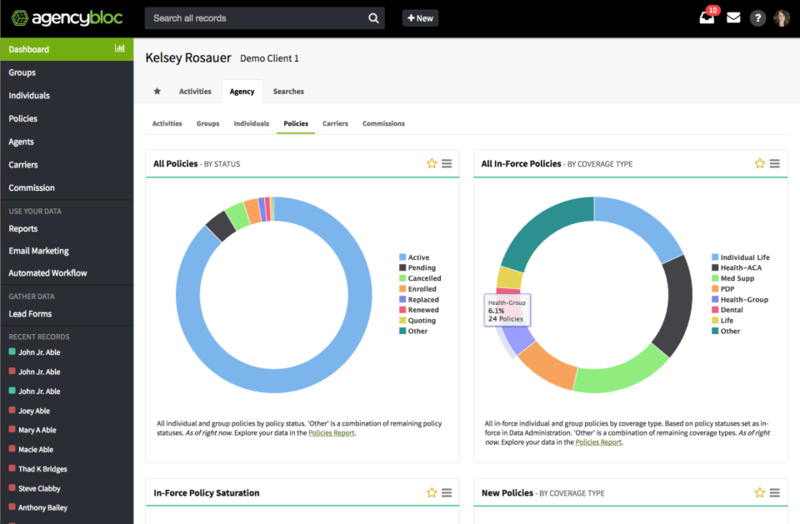 Pros: AgencyBloc's streamlined platform offers the ability to easily search for policies, clients, activity history, as well as track activity and progress among other agency staff. Cons: Can't say there is anything I don't like. We moved to AgencyBloc from another platform about 8 months ago and the transition was painless. Overall: We received better client organization, tracking, in office communication and processing which has increased productivity greatly. It's rare to find a product that not only meets and exceeds your expectations like AgencyBloc does. Pros: This software gives me the ability to keep track of clients and truly understand my business. The reports function allows me to run a custom report in literally seconds. In addition, the ability to create a follow-up activity for a client or prospect has provide me one software that keeps my team completely on top of follow-up! I have referred several colleagues to AgencyBloc. We're a small 2 pers Medicare office, new to AB, getting going was pretty easy just in time for AEP. Pros: What we like the most is it is insurance industry specific and that we are able to tailor it to our specific wants and needs. The ability to download scans into specific clients files has simplified our startup with AB. Instead of keying in all the old notes I scanned them into pdf's and downloaded those. The same goes with plan analysis and supporting documents. With AB our client files are now always with us and the hard copies are elsewhere in a secure HIPPA compliant location. Cons: I often find that what I think I don't like is overturned with some experience and the help desks input. There is some clumsiness in downloading stored file to attach to emails etc but I'm still finding my way around. Pros: The software is very easy to train new employees. The new hires have a very small learning curve. New hires are and running day one. Adding clients is very easy and quick. Stability of software has been the best part of using AgencyBloc. Cons: The sort features are somewhat limited. Would like to see ability to search for clients and agents expanded. Best data storage product out there! Comments: I came to work part time for a delightful local insurance agency last year and was given a sufficient amount of instruction on how to navigate through AgencyBloc. Open enrollment came upon us and we were so busy. I found entering and accessing information into AB was incredibly simple. Correcting, updating, or adjusting information ( even creating a custom field) was also simple. I have used several data systems in my career (which has not always been in insurance) and have found AB to be one of the most user friendly systems for data storage and information/report retrieval. My congrats to the developers for creating a comprehensive data base for information storage and retrieval that is so easy to use. Most others I have used are layered with too much information and duplication. I have nothing but good things to report about AB customer service. When we call, the AB staff have consistently answered in a pleasant and helpful manner and have provided usable and understandable answers/instructions. In my experience, thus far, I have not had to leave a message and wait for a call back. All this is a rarity, but certainly appreciated, in the current business climate. Pros: AgencyBloc has a nice "dashboard" with various tabs that you move through to complete different tasks. I found it to be a more intuitive interface. Its also web-based so you can use it anywhere. Another facet I found important was not having to worry about downloading updates or new software onto my computer. Cons: I would like to be able to see individuals within a group and their enrollment for the various policies offered by the employer. I also think it would be an enhancement to have the capability to build an individual contact at the same level of the employer. When there is a family enrolled I would like to have the ability to have spouse and children fall under the primary applicant instead of creating an individual contact for each member enrolled on the policy. Overall: The price-point is inline with what I wanted to spend and I have the opportunity for this system to grow with me and my agency as my needs change. I am very satisfied with the system and have experienced excellent service support when I needed it. Is extremely user friendly, I have been able to easily use this software. I do not consider myself computer savy but this is the easiest software I have ever used. Organizes my clients so I can easily find them. Allows me to keep all my contact information online including phone numbers for insurance companies. I have not lost any papers in a very long time! I have not had to call and ask for support from their customer service. I have not needed it! Overall: I would highly recommend this service to any health and life insurance agents. I do not sell auto and home so I do not know if it would work well with that business. This software doesn't require complicated computer skills to operate. It really has changed my life. Comments: We love AgencyBloc!! It is so wonderful to find information regarding our clients in one data storage location. The software has streamlined how and what information we keep track of. What we appreciate most about AgencyBloc is, as they have grown they have not lost sight of what is most important when it comes to software and that is "Customer Service". In the three years since I have been using AB I have always had my questions answered on the first call. Not once has someone had to call me back to resolve an issue. This is huge!!! There is nothing more frustrating than calling customer service and having to leave a voice mail of the problem and then getting a recorded message telling you they will return your call within 24 hours!! Another thing I appreciate about AB is they are very careful and thoughtful about upgrades. When we receive an upgrade, we can count on the fact it has been tested and is tried and true. Thank you so much AgencyBloc Team for providing an excellent product that is dependable and we have great confidence knowing you and your team sincerely care about us and the success of our business. Pros: The vendor was very helpful. I needed some special set up help and they worked very hard to meet my needs. The system was priced very competitively as well. I responded to an email that offered a trial period and in a very short time I was up and running on the trial program. There was quite a bit of set up required, and the support team got right on it and had me operational in no time. I was surprised by how much work they were willing to do just to facilitate a trial offer. Cons: Like any agency management system, it always seems like the person who wrote the program never worked in an agency. Some of the terms were strange, and that resulted in some of the functionality being lost. Recommendations to other buyers: Don't start an evaluation of something this complex unless you have a lot of time to devote to the process. Make sure you are not going to get into a busy season prior to completing the review. Plan on lots of time to implement any new system. Great management tool. Smart and Linking features help tremendously. Pros: Ability to quickly find a Client and supporting information. Linking a Relative or Spouse can simplify changes or adding updated information. Agency Bloc Software Is everything and more! Pros: AgencyBloc is very simple to understand and use. It's easy to set up new applications, make new policies, and use data entry. The commission structure is perfect and its ease of use makes it that much more enjoyable to use. After purchasing this software, implementing and importing our old and new data, my job of configuring commissions for our agency has been made so much easier. Instead of usually taking me 22 days of the month to get completely done, I'm done in less than 4 days with agencybloc. It's been a life and most of all, time saver! Cons: When I find some, i'll let you know! Overall: 10/10. We have researched countless softwares and Agencyblocs topped them all. It's by far the most advanced and easiest to use among the ones we tested. I would recommend any company to evaluate this software against what it currently operates and I'm sure this will beat it hands down. Thanks again AgencyBloc in your help in getting us started and your fantastic customer service! Pros: Very user friendly, and reports are quick and uncomplicated. Cons: Duplicate info on some pages, Counties don't populate correctly for some cities. Overall: Compared to our last data base, this is a walk in the park! I like the ease of reports. Well worth the upfront setup time !!!! Pros: The staff at AgencyBloc have been available, helpful, patient, professional and very easy to work with. I've had all my questions answered promptly. The implementation of AB replaced a tedious, manual process (using Excel pivot tables) to manage a very unique and complicated commission tracking and payout need. Having the information backed up regularly and web access was crucial to our firm. Cons: I hope that AB will further develop reporting options and facilitate the updating of fields in large groups of policies without having to either be creative or work with each policy individually. It would be great if one could select fields from within AB to generate into a report and have those be a bit more professional looking. Overall: I highly recommend this solution to any firm looking for an easy to learn & use commission based system. Pros: Honestly everything, its so easy to use. The Agency Bloc company keeps you updated on all the updates and even goes as far as to do training's for all the updates and past updates. Comments: We are a growing ancillary General Agent who was in need of a more robust database and tracking system. We were previously using Microsoft Access to track our agents quotes and service issues but that limited us to one user and was not cloud-based. We added another employee and it is imperative that all members of the team can see the activities and notes from the different groups we manage. Agency Bloc fits this bill. Agency Bloc helps us manage our entire current block of business as well as all our new quoting activity and customer service issues. If one person goes out, the next can easily pick up on open items or issues. The system will even allow us to pay commissions if we pay the upgrade. As we quoted out ideas for an agency management system, we talked to a variety of vendors. Agency Bloc was the most reasonably priced. I recommend fully Agency Bloc to the agents I work with. It is an affordable professional solution for benefit agents. Software is very user friendly, allows enough customization for my use, and adds value. Pros: Ease of use, has nice accessibility with being internet-based. Also, it is made for health insurance industry so it is secure. Pros: It has so many features on it and it allows user to input so much detail about your client. Also, even if you make a mistake, it's very easy to go back and fix without losing data. I've also been very fortunate to have a customer service rep (Degin) who is always around to provide help and support when I need it. Overall: My experience with this program has been great from the very beginning. It is extremely user friendly and has so many features. Recommendations to other buyers: Take advantage of the trial so you can see for yourself how great this software is. Pros: There are so many facets of the software to help market anyoneproducts. Like that you listen to us and change the software accordingly. You are there for us immediately on chat support. Overall: It is perfect for storing all our files in one place and at our fingertips. We can use it in many ways to help remind our clients when it is time for renewals, so they will not let their policies lapse. It does many things, allowing everything being accessible with just a tap of the keys instead of searching different sites for the information needed. Pros: This site/program is FAST, User friendly, and has the ability to upload pdf files so if you have a "crash" in your company or your own personal computer, you've lost no files. Cons: Since this program is "national" you can only "customize" it up to a point. There are certain things that you may want to do and can't since it would affect the program for everyone. Overall: Overall, this is an excellent program and site. I've been able to be very "creative" as I've learned the limitations of what I can change within the program to accomodate our needs. These "creative" methods have helped make the program more suitable for what we need to do. Considering that once all of our data is in Agency Bloc, and I no longer have to keep flash/thumb drives for a backup, I'd recommend this to any company in this line of work. Great software for health insurance agency! Pros: Finally a agency solution for a health agency!! We have been looking for a product like this for years! Support has been excellent, and for our agency it works perfect. Has elminated hours and hours of plugging in commisions for agents. We actually had one person that was doing this for a full time job and he now has become one of our top selling agents, because he can focus on selling not entering in commisions all month. Cons: Would like more features available like to query birthdays so we can send out cards, and more query options. But, this is the best thing out there from what we saw with other companies. Overall: I would definitley reccomend this product to any health and life agency. Pros: In the past we have manually calculated commission for our 100+ agents using spreadsheets; this has simplified our process and provided more detail to our agents. We deal with multiple carriers and AgencyBloc has excellent functionality and customization to meet our needs. Cons: The initial setup is tedious, but the customer support at AgencyBloc helped ease the process - they were great! 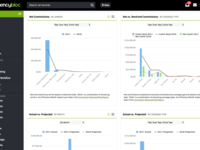 Overall: AgencyBloc's commission tables and import mapping will save us hours of time each month in calculating commissions. The search feature will help us to answer agent questions quickly. We are very satisfied with AgencyBloc and would highly recommend it to anyone looking for a commission tracking software program! Cons: When adding contact information for some of the tabs it can be a bit redundant. Search bar at the top doesn't apply within the category. Overall: Able to keep all information on groups and brokers in one area with ease to find said information without using multiple programs. We have implemented the notes section to download documents we all need access to. Pros: I have found the system to allow me to track my clients in an organized fashion. I am able to print reports that I can use in other programs to follow up with clients and track commissions due. Cons: I would say it is a limited system from others I have worked with. Overall I am very pleased for my needs. Overall: overall I give it a 9 for my needs out of 10. I must admit part of that may be my limited use of the system. I am caught up now in entering all my clients and the next phase is to go through and update for activities that have occured over the years. So I will learn even more as I proceed. I have found everyone in the company to be very helpful and supportive. Pros: The software is very easy to access and get my clients information pulled up very quickly. I use for notes under policies and find it very easy to use. Cons: I do not like how i have to go back to the original group client name each time i want to click on a different policy under the group. Overall: I am so happy we found agencybloc. We have tried other client management systems and this one really takes the cake. I think the best part of it is the customer service and the willingness to keep changing and making it better. Recommendations to other buyers: Creating activities is a great way to stay on top of tasks and keep up on the day to day in the office. Pros: This software is very easy to use and we have found it to be a beneficial tool for storing/organizing our clients' information. You are able to input both individual and group clients, and even upload documents to store (i.e. applications). The price is very reasonable for such a great system! Cons: E-mai integration: would like to be able to send a mass e-mail directly from the software. Overall: I highly recommend AgencyBloc to anyone who is looking to manage their clients and prospects. It is well worth the cost! Pros: AgencyBloc is offers a service that compares to no other software on the market. Using AgencyBloc is effortless! Cons: We would love to see e-mail integration and marketing support built into the system. Overall: We looked at several software options that claimed distinctiveness but after exploring and testing out those options AgencyBloc became the clear choice because it simplifies our health insurance organization. AgencyBloc is intuitive, uncomplicated and the service and support is fantastic! We're happy to report that Email Integration is coming - we have a number of agencies test piloting the enhancement right now. Glad to hear the software is working well for your agency! Pros: We love all of Agency Bloc as it has changed they way we do business not only for E&O reason's but also for customer sales f/u and especially our f/u on claims. Our tracking of clients and prospects for future sales has improved our bottom line. The ease of use has been beyond our expectations and the customer service is outstanding with response times being exceptional. We would highly recommedn this and already do to anyone who will listen. David and his group are excellent. Pros: One of the best I've used. 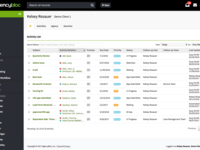 Our commission tracking and processing between producers, subproducers, agents and financial specialists can get messy sometimes and AgencyBloc helps mitigate the problems and run smoothly. Pricing is also very simple and fair. Cons: I cant thing of anything that I don't like about the software. It's an expensive I don't really want in the agency but it's certainly not AgencyBloc's problem. I would recommend this to anyone looking for an easy commission program! Cons: There really isn't anything I could think other than the price. Since we only use the software 1x per month.